We are currently adding vendors to pay via EFT. 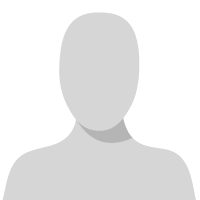 We had a power outage recently and since then we cannot generate the EFT files. I have gone through and check the path of the EFT files and I have processed the "check links" and "reconciliation" for all modules. Unfortunately, I am getting the same error. I would appreciate any input you may have. Looking at the error message it seems to indicate that you are missing the EFT file format setup for that checkbook. 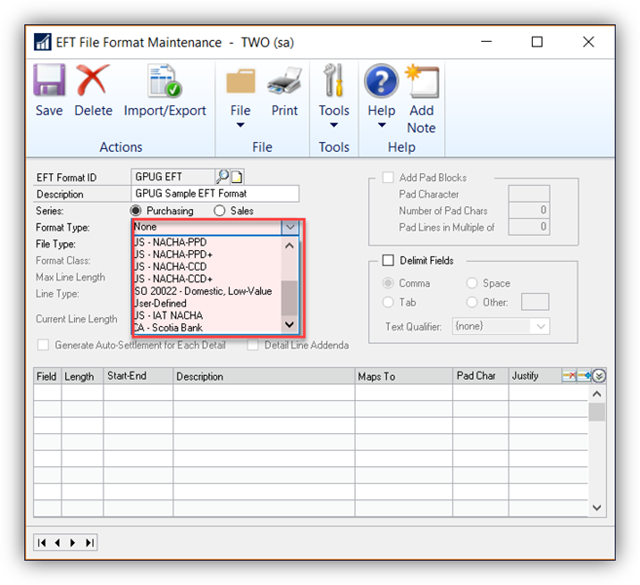 When you go to the EFT File Format do you see a file format for the checkbook? It would be this window. In this post we'll cover how to Set Up EFT's for Payables and Receivables, in the next post, found HERE we'll take a look at how to use them and the best practices around that! 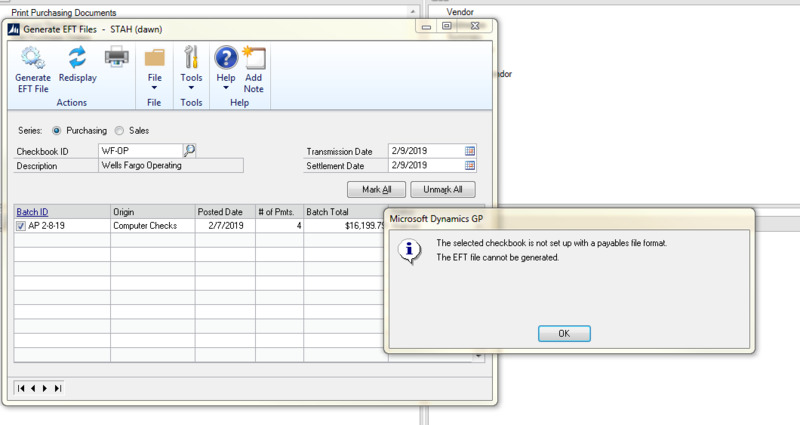 You can set up and use Electronic Payments in Dynamics GP by setting up and using the EFT functionality that's already part of your GP install! Simply go to your chequebook (checkbook!) > EFT Bank > Payables Options and check to see if the File Format is listed there. Perhaps with the power outage, something was messed up in setup (although that would indicate you might have other issues too). 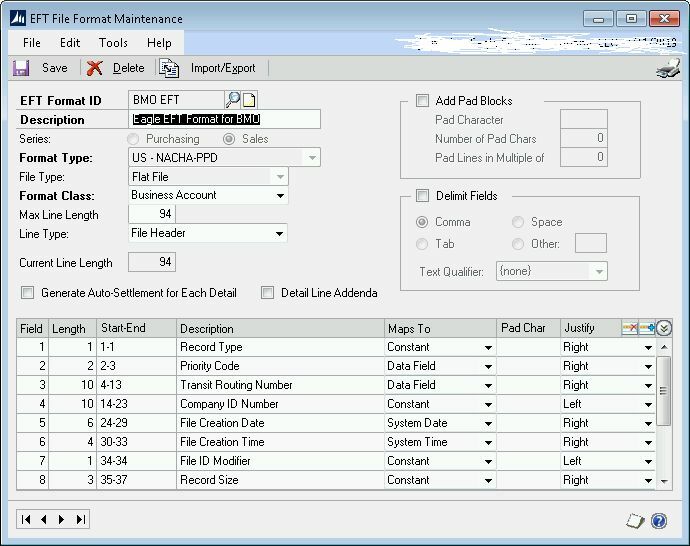 The error indicates the checkbook doesn't have a format selected for it to use. @Jennifer Wheeler is correct, if the format is missing entirely, you may need to recreate it. At that point, my recommendation would be to restore a backup of your company from prior to the power outage to a test company database so that you can export the format and import to the company to easily recreate it and know it's exact. I have verified the information. What I don't understand is that the EFT has been working for over a month now. I have just been adding new vendors along the way. One of my vendors on this EFT submission is one I have been sending payments via EFT since I first set it up. We have not had any problems until this last week. The only thing that happened was a power outage and since then I cannot get it to work. I'll admit it doesn't make sense, hence my comment that it could be indicative of other issues potentially. It would be unusual for one thing to somehow break due to an unplanned cut of power and nothing else to be affected. The reality is it's either a user-based change to setup that occurred or a result of the power outage that may have changed something. @Dawn Sutton since you have verified your settings and you mentioned a power outage I would recommend a server reboot. Like most programs GP can be quite sensitive ​​when there is a power interruption. Sometimes rebooting will help reset things. I appreciate everyone's input. I believe we finally got everything fixed. Have a good day.